Fourth in the series on the three heavens and the throne of God. I will share insight into the motion of the sun and moon through the six gates of heaven as described by Enoch and Solomon. 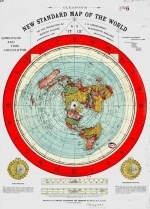 I will also reference the previous discussion on the nature of the firmament, canopy, and dome-like structure enclosing the flat circular plane of the earth as well as other passages which I previously did not connect to the concept of the flat earth as revelation for world. It is only with reassessment that I have been able to recently connect such concepts to this as revelation. Such knowledge elaborates even further upon the possibility of the North Pole as being the cradle of humanity and portal to the throne of the Most High.